It was a little more than a year ago when world-class bow maker and hunter Paul Schafer died in a skiing accident. The tragic accident in January of 1993 brought an end to a life filled with hunting success. People going to the Great Falls International airport are now able to share in that success. A display has been set up of some of the North American animals Schafer took during numerous bowhunting trips. "We wanted a place for the public to see them. I didn't have place to display them or store them," said Schafer's father, Phil. "They didn't want them sold and they wanted to keep them together," said his sister, Ann Schafer Wankel. So Joan Simonetti, another of Schafer's three sisters, approached airport manager Joe Attwood about displaying the animals. "Joe has been really helpful in getting this done," she said. Traveling back and forth, catching planes, it's nice to see them. Alot of people new Paul and thought alot of him, and they'll be able to see them," Simonetti said. "A lot of friends have commented that it's nice to have it displayed where the public can see it." The display of animals taken by Schafer with his recurve bow over the years hangs on the second-floor lobby wall above the restaurant. The heart of the display and the best evidence of Schafer's prowess with the bow is the grand slam sheep. 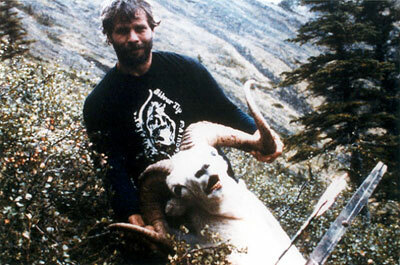 In 1986, Schafer became just the third bow hunter to collect all four species of North American wild sheep-Dall, Bighorn, Desert Bighorn and Stone. What set his apart from all others as that each animal was world class, ranking in the top 10 in the world. But there was more to Schafer. A two time state wrestling champion, he was the first inductee into the C.M. Russell High Hall of Fame. He once carried the ball a record 58 times for Montana State's football team, gaining 234 yards and scoring the winning touchdown in the 1968 edition of the cross-state rivalry with Montana. Attwood said he was happy to obtain the display of a hunter such as Schafer. " I never had a chance to know him, but I heard he was a unique individual, " Attwood said, "Paul was a special person because he lived and extraordinary life." As for the display, the airport manager said, "it's unique in that it's a bow hunter as opposed to a gun hunter. With the grand slam, it's more unique. "We're very pleased to have the opportunity to display a collection of this magnitude, There are others, but that he has the grand slam sets it apart from others." The airport display is only a part of Schafer's collection. Not displayed are animals he took on trips to Africa, including a cape buffalo, plus a grizzly bear, Simonetti said. To help visitors understand the magnitude of the display, the Great Falls Archery Club and the Montana Bowhunters Association have donated money to have brochures printed. Attwood said they first discussed putting a plaque up to explain he display. "But I don't think you can get it all on a plaque. There's so much to say about Paul," Attwood said. Jerry Pearsons, secretary of the archery club and classmate of Schafer's in junior high and high school, agreed with Attwood's assessment. "Paul was probably one of the best bowhunters that existed. his ethics were beyond reproach," he said. We idolized him to some extent." Parsons also felt the display was an appropriate reminder of Schafer. "What kind of legacy does a bowhunter leave behind? His trophies." Attwood said he envisions the display becoming as popular as the Alaskan brown bear displayed at that airport. "In the fall, I'd imagine there will be alot of hunters standing there looking at Paul's collection," he said. Wankel has been to the airport to look at the display. "It made me feel very proud. I hope people realize they were all shot with a bow, it takes a lot more skill than shooting with a gun. And Paul didn't just shoot anything, many of them are records." Looking at the display and what it means has given Wankel a better appreciation for her brother's skills and the impact he had on the people with whom he hunted. "We didn't realize what a good hunter he was until after his death. When we started getting letters from all over the world, that's when we realized just how good he was," she said. "I think Paul would be amazed that they're displayed up there. It's not something he would have organized on his own. It's all a little overwhelming, but it's nice that there's a place for them. Paul meant the world to all of us."